Easily add privacy and a fresh look to your Bathroom Windows, Showers Doors and Skylights without the cost of an expensive remodel. Get the privacy you need for your bathroom windows without having to resort to heavy drapes or blinds which block almost all natural light. Create just the right amount of seclusion in your glass shower doors with one of our Frosted or Textured Film designs. Reduce heat and glare in your bathroom skylights using our UltraCool® Heat Blocking Window Films which feature various degrees of light transmission and block 99% of harmful UV rays. 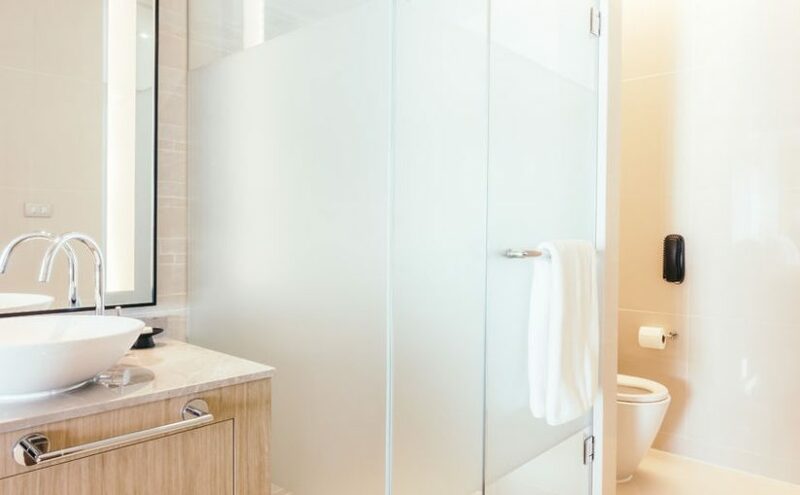 Almost all of our hundreds of unique Decorative Privacy Films are water resistant and constructed to withstand the moisture of your bathroom’s environment. All of our SOLYX® films are covered by our 5 year manufacturers warranty. I am looking to order and have installed window film in a few shower windows. Does your company do that? Hello Denise, We do not currently offer installation services for our films, but we are working on creating a Dealer/Installer map so that customers like yourself can find a qualified installer close by. In the mean time you can email us at info@decorativefilm.com and we will do our best to connect you with someone in your area. Thanks! I have 3 small plastic windows in a garage overhead door. 12″ x 24″ each. I’m looking for a window treatment that allows me to see out and won’t allow anyone to see in. What do you have available? Can you send me a link? Hello Vince, We offer several One Way Films (https://www.decorativefilm.com/specialty-one-way-visibility) in a variety of different styles that should work well for your intended installation on your garage door. However, be warned that all One Way Films can be seen through under certain lighting conditions (for example: When the light is on inside and it is dark outside). Unfortunately it is not possible to create a true One Way Film that works under all lighting conditions. We love love our film over our garden tub.We have had it for about 4 to 5 years. We get direct sun in the afternoons on the window.Anyways the corners are starting to curl.How do we fix the problem?How can I post a picture of our window on here?We love love it. I am looking for a film to install in a shower window. The window is not in the direct path of the shower head, but definitely has the potential to get wet. I noticed your films are ‘water resistant’…will they work on a shower window? Is there one type of material vs. another that I should be considering? Thanks! Yes, both adhesive and static cling films can be installed in humid and moist conditions. If being installed on a shower door, mounting on the outside of the shower door is recommended.